Purdue University 's acquisition  of the for-profit education provider Kaplan University spurred national debate about shifting paradigms and blurry lines between for-profit and nonprofit institutions. Underlying those discussions were local questions about the effects on Purdue's online education strategy. Mitch Daniels, Purdue's president, described the purchase as an effort to advance Purdue's lagging position among research universities, in part by adding Kaplan's nearly 30,000 working adult students. Would the university use its contractual relationship with Kaplan Education, the services company that manages Purdue Global (formerly Kaplan University), to kick-start online learning expansion in Purdue's core programs at its other campuses? 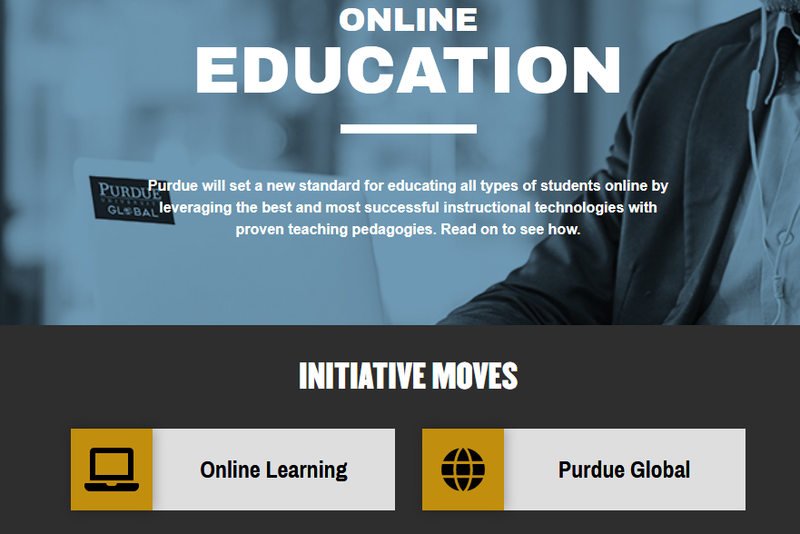 Would Purdue Global and the rest of Purdue share online offerings? How would faculty members respond to such unprecedented changes? Close to two years after the initial announcement , answers are beginning to emerge. Purdue last month established a central administrative office, Purdue Online, to act as an online program manager of sorts for the institution’s three on-ground campuses as well as Purdue Global, which now exists as a public benefit corporation and does not receive state funding. Administrators told “Inside Digital Learning” they're eager to learn from Purdue Global's successes but not yet at the point of sharing technical infrastructure or combining staff resources. Experts weigh in  on the initial Purdue-Kaplan announcement. Details emerge from the regulatory process . Concerns arise over a nondisclosure agreement  that's later rescinded . Representatives of the original Purdue campuses have been meeting regularly with instructors and deans at Purdue Global, sharing ideas and identifying areas of potential academic collaboration while drawing lines between the two entities' focus areas and target audiences. Purdue administrators have also been paying close attention to high-profile competitors on the online landscape, including Arizona State University, which administrators cite as a model for their ambitions. Purdue's vision for its online programs, according to administrators, preserves distinctions between traditional Purdue and its former for-profit extension while taking advantage of overlapping goals and complementary offerings. Online education observers will be tracking Purdue as a potential new collaborative model settles in. And Purdue's faculty -- portions of which bristled at Purdue's handling of the Kaplan acquisition -- will be watching closely and warily. In late 2017, after a decade as Purdue’s chief information officer, Gerry McCartney began transitioning into his new role as executive vice president for Purdue Online. He's managing a team that currently numbers 90 staff members. “What Global has done is add another arrow to the quiver, and what my job here at Purdue Online is to do is to ensure that all of the arrows can be maximally effective in the audiences they’re trying to serve with our online products,” McCartney said in an interview. Purdue’s existing online programs -- 92 in total across four physical campuses; mostly master's degrees -- aren’t particularly well-known nationally. Last fall, Purdue’s main campus in West Lafayette enrolled 2,252 exclusively online students, while 8,354 students took at least one online course. Close to 150 students enroll in fully online programs at Purdue's Fort Wayne campus, according to Carl Drummond, vice chancellor for academic affairs at Purdue-Fort Wayne. According to data from the Department of Education, roughly 13 percent of the 12,000 students at Purdue's Northwest campus are enrolled exclusively in distance education. But McCartney emphasizes that the institution has been expanding its online portfolio more quickly in the last six months than at any previous point. By this summer, McCartney believes multiple Purdue campuses will jointly offer online programs. Plans are also in motion for at least one online certificate program at Purdue Global that will serve as prerequisite for an online master’s program delivered from a Purdue campus. The acquisition of Purdue Global, which is headquartered in Chicago, dovetailed with a nagging sense among Purdue administrators that a cohesive strategy and more resources would be necessary as the online education market matures. Kaplan’s success in scaling its online offerings offers Purdue administrators a road map, Dooley said. Kaplan programs operate from a common course template into which instructors plug syllabi and assignments. Groups of instructors team up to design program curricula before leaving individual instructors to create courses within the broader framework. To minimize student confusion, some academic policies, like the penalty for turning in late assignments, are common across all courses in a program. Courses undergo a review and refresh every three years. McCartney’s office hasn’t committed to preserving all of these tenets for the broader institution’s subsequent online efforts -- but Dooley identified all of them as potential models. He thinks Purdue University as a whole can learn valuable lessons from what Purdue Global does well. Likewise, Purdue Global representatives recently have joined in discussions as Purdue ponders switching its learning management system provider from Blackboard to Canvas or Desire2Learn, according to Dooley. Purdue Global currently uses the latter. Still, Dooley doesn't expect that Purdue will end up aligning with Purdue Global on aspects like the learning management system and data systems. "I don’t know that we need to share those particular areas," he said. Purdue University and Purdue Global do not currently have any technical systems in common, according to Dooley. He speculated that Purdue might team up with Purdue Global to have more leverage when negotiating publishing contracts with companies like Elsevier, but no concrete plans are in place. "As contracts come up, we’ll look at each one individually," Dooley said. Everything from nondegree programs to competency-based education is on the table for discussion as Purdue figures out its online approach, according to McCartney. Individual campuses will still set the agenda for their programs, but with support and an overarching mission set by Purdue Online. Looking at Purdue Global’s offerings also includes identifying areas where the rest of Purdue can be complementary, Dooley said. For instance, pairing a data science program at Purdue Global and a technical training program at a Purdue campus to show employers that Purdue is producing potential employees at multiple levels of a company or industry. McCartney also raised the possibility that Purdue could team up with Purdue Global on an interdisciplinary master’s program to which both entities would contribute educational content. Much of the Purdue system’s current online output serves its residential population -- students with busy schedules who want to mix online and on-ground classes, particularly in disciplines that lend themselves to flexible teaching formats. Dooley said the institution plans to invest more in this area. But the adult market McCartney cited is also a prime target. Purdue Global’s success with an existing population of 29,000 students, many of whom are adults seeking degree completion at the bachelor's level, contributes to that goal, but the rest of Purdue ought to follow suit, Dooley said. With a low national rate of unemployment, the institution has more work to do on tapping in to markets ripe for online education, which often caters to working adults who need new career opportunities. McCartney has identified a prototypical student Purdue hopes to reach with its online expansion: a woman who graduated in 1998 from Oklahoma State University, for example, with a degree in chemical engineering who’s worked in Oklahoma at ConocoPhillips for 20 years but needs new skills that younger employees are bringing to the workplace. “She’s not going to come to West Lafayette to get a master’s degree, and she’s probably not terribly interested in her home university master’s degree,” McCartney said. The relationship between Purdue Global and the rest of Purdue looks in some ways like relationships between online program management companies and their institutional clients, with marketing and recruitment among the areas where Purdue Global is offering informal support. But Dooley sees the connection as separate universities taking advantage of their newfound alignment. OPM companies often keep a substantial portion of their clients’ revenue, but “At this point we haven’t been really focusing on accounting,” Dooley said. The exception, thus far, is the online nursing programs at Purdue's Northwest campus, which enroll 1,164 students -- roughly 75 graduate students -- in R.N. to B.S.N. study. Until this year, the institution had an OPM contract with Academic Partnerships for marketing and recruitment of its online nursing programs -- the only online programs it offers. Within the last few months, the institution has begun the process of transitioning to a new contract with Kaplan Education, which also powers Purdue Global. "It made sense to senior leaders at West Lafayette that for those programs who are working with commercial partners, that we work with the same one," said Lisa Hopp, dean of the College of Nursing at Purdue-Northwest. She said the institution would have remained with Academic Partnerships had the Purdue-Kaplan deal not happened, but her team has been equally satisfied with Kaplan thus far. Across the system, the Purdue Online office will serve a coordinating function, helping avoid online program redundancies across the Purdue ecosystem. The model bears some resemblance to UMass Online , which administers online programs offered by individual campuses within the University of Massachusetts system. Online enrollment continues to grow . How university systems structure their online programs . States pursue methods to reduce cost burden  on online students. For instance, Purdue’s College of Education currently offers a program in instructional design and technology that resembles a Purdue Global master’s program in learning design and technology. The Purdue Global program's enrollment falls short of the 300 students in the comparable Purdue program. According to Dooley and Steve Beaudoin, a professor of chemical engineering who co-chairs the University Senate’s select committee on Purdue Global, discussions are under way between the two entities over whether Purdue Global should transition its program from degrees to certificates or close altogether. In another case, two similar programs will be divided based on geography. Administrators at Purdue-Northwest have worked out a "geofencing" arrangement with Purdue Global in which nursing students who live in Indiana, Illinois and Wisconsin will, beginning this spring, be funneled into existing online nursing programs through Purdue’s Northwest campus. Students from other parts of the country will enroll in a similar existing nursing program at Purdue Global. "To have two Purdue programs in the same market doing online teaching and learning didn’t seem to make sense," Hopp said. On the other hand, the new systemwide online strategy won't fundamentally alter the approach to online at the Fort Wayne campus, according to Drummond, the vice chancellor for academic affairs at Purdue-Fort Wayne. The institution's handful of undergraduate online programs largely serve residential students, and in general the student body tends to hail from across the region -- other parts of Indiana, southern Michigan and western Ohio. Online isn't central to the Fort Wayne campus's mission, according to Drummond. "As a campus here at Fort Wayne, it’s not our mission to serve the world or the entire United States," and the creation of the Purdue Online office won't change that, Drummond said. From what he's seen, the plan to grow online at Purdue won't compromise his institution's existing programs, though it might get them a stronger marketing push. A higher level of administrative support for online programs was "not something that we were clamoring for," Drummond said. "But we’re happy to have it." The unprecedented interaction between a nonprofit public institution and a former for-profit provider still has some Purdue faculty members gritting their teeth. David Sanders, an associate professor in the university’s department of biological sciences and former chair of the University Senate, says he speaks for numerous instructors who aren’t convinced that Purdue Global’s pedagogical approach is worth emulating. Some faculty members frown upon Purdue Global’s ownership of academic content and its lavish marketing budget, rumored to be substantially higher than that of Purdue, according to Sanders. He believes the rigor of Purdue Global’s academic content doesn’t match what Purdue offers, which makes Purdue Global’s comparatively higher average GPA misleading. Purdue Global policies that Purdue administrators cited as intriguing strike Sanders differently. He believes professors should be allowed to set their own policies and that education should be focused on providing knowledge and provoking critical thought rather than primarily providing skills. “We are talking about the Walmart-ization of higher education -- as quickly as possible, as cheaply as possible, and it will be broken in two years,” Sanders said. Other Purdue faculty members are spending the early months postacquisition seeking common ground with the Purdue Global side. Beaudoin sees potential in Purdue Global’s robust marketing prowess and the uniformity of its course experiences. Beaudoin’s committee has been driving conversations about drawing clear distinctions between Purdue and Purdue Global’s respective online output. “We don’t want to steer [prospective students] toward the Global program if really the best program suited for their needs is a West Lafayette or regional program,” Beaudoin said. Though some faculty members likely won’t be happy with the arrangements no matter how they play out, Beaudoin said he’s cautiously optimistic that Purdue will be able to benefit from Purdue Global without being overtaken by the institution’s new property. “I don’t want people to feel like a new unit is being brought into their operation to do the same thing that they do,” Beaudoin said. Russ Poulin, senior director of policy, analysis and strategic initiatives at the WICHE Cooperative for Educational Technologies, thinks Purdue’s postacquisition plans track with the vision Purdue leaders presented upon announcing the move. One area of concern, however, is the potential for brand confusion between Purdue Online and Purdue Global. In Colorado, where Poulin is based, he often hears that people accidentally call Colorado State University-Fort Collins offices when they hear advertisements for CSU Global – the university system’s separately accredited online arm. “I think it will probably cause more work on the back end in terms of trying to help students understand and figure out where they’re actually supposed to be,” Poulin said. Indeed, instructors at the Fort Wayne campus have "on occasion" been confused about the difference between Purdue Online and Purdue Global, according to Drummond. "It's a time of transition," Drummond said.